The record books took quite a beating in 2018, led by the achievements of living legend Jonathan Rea. With the thirteen rounds of 2018 done and dusted, it’s time to look back at what was an extraordinary season for the MOTUL FIM Superbike World Championship, during which the history books were rewritten several times. New records were set at just about every other round, some of them which had previously stood for over two decades. Another year, another season during which Jonathan Rea (Kawasaki Racing Team WorldSBK) was the undisputed record-breaker of WorldSBK. KRT’s leading rider began the year matching and beating Carl Fogarty’s win tally, setting a new provisional record of 71 victories. Better still, Rea emulated his childhood hero’s four world titles – with the added difficulty of having achieved them in succession. That was just the tip of the iceberg for the Northern Irishman. At Qatar, Rea equaled Doug Polen’s record of 17 wins in one single season, a feat that had been left untroubled since 1991. He also extended his winning streak to eleven under the floodlights of Losail – until this year, no one had managed more than nine on the trot. And to complete the Losail hat-trick, his Race 1 win was his 57th for Kawasaki, the most any rider has taken for a single manufacturer. And it doesn’t end there for the man from Ballymena. He reached a total of 17 WorldSBK doubles before the halfway point of the season, surpassing Fogarty and Troy Bayliss’ 16, and has since extended that number to 24. Finally, there’s the total podiums count: Troy Corser’s outstanding record of 130 has been confined to history by Rea’s current 134. Moving on to other names: Tom Sykes (Kawasaki Racing Team WorldSBK) Rea’s companion in green from 2015 to 2018, proved why he’s often dubbed ‘Mr Superpole’ by becoming the undisputed best qualifier in WorldSBK history. 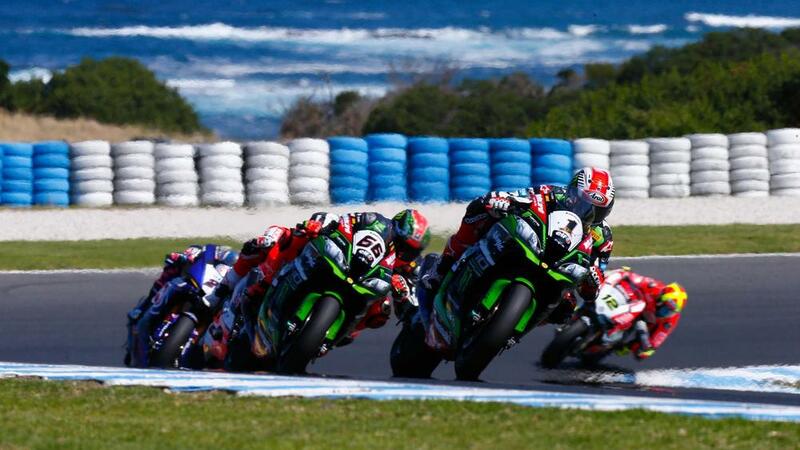 The Yorkshireman equaled Corser’s tally of 43 as the season kicked off at Phillip Island, before pushing that number all the way to 48 by the end of the season. To top it off, Sykes also won this year’s Tissot Superpole award. While 2018 wasn’t Chaz Davies’ (Aruba.it Racing – Ducati) best season in the series, the Welshman did reach a total of 79 podiums in WorldSBK thanks to a return of 12 rostrum finishes through 2018 – only eight other riders have taken more than 75.
.@RAFF_35 "The team is working so hard this year"
From the big guns to a fresh face: In Argentina, Gabriele Ruiu (Team Pedercini Racing) became the youngest rider on record to take part in a World Superbike race at the age of 18 years, 4 months and 27 days. The Italian also quickly became the championship’s youngest point scorer, picking up two points in Race 1 at the Circuit San Juan Villicum. Elsewhere around the WorldSBK paddock, in the FIM Supersport World Championship Sandro Cortese (Kallio Racing) became the first man to claim both the Moto3™ and World Supersport crowns. ‘Sandríssimo’ is also the championship’s first debutant to win the title since Cal Crutchlow in 2009. Then in the FIM Supersport 300 World Championship, Ana Carrasco (DS Junior Team) continued tearing down barriers in the world of motorcycle racing. After becoming the first woman to win a world championship race in 2017, the Spaniard set several more milestones in 2018: first woman to lead a world championship, first to secure a pole position, and of course, first to win a world title. A huge achievement that did not go unnoticed, making headlines all around the world. How many more memorable moments will be created in 2019?